President Barack Obama meets with Rev. Billy Graham at his house in Montreat, N.C., April 25, 2010. All the presidents needed the prayer. But they also wanted the picture. 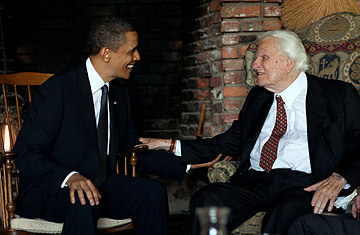 When Barack Obama visited Billy Graham on Sunday afternoon, he became the 12th president to meet with the famed evangelist  but the first to do so at Graham's mountaintop home in Montreat, NC, a rambling house built from the remnants of log cabins that Ruth Graham salvaged more than half a century ago, and where Billy Graham has lived ever since. The two men visited for 35 minutes over coffee, along with Mr. Graham's son Franklin. They discussed their wives: Ruth Graham passed away in the summer of 2007, but her spirit is very much present in the house where she raised their five children. They also discussed their passion for golf and their experience in Chicago, where President Obama began his career as a community organizer working with local churches, and where Mr. Graham attended school and held several significant crusades. According to sources familiar with the conversation, President Obama shared how lonely, demanding and humbling the office of President can be, and how much he appreciated prayers of so many citizens. Mr. Graham presented the President with two Bibles  one for him, and other for the First Lady. President Obama then prayed for Mr. Graham, who in turn concluded with a prayer for the President, his family and his Administration. Then the president departed to attend a memorial service for the miners in West Virginia later in the afternoon. President Obama's visit with Mr. Graham was several years in the making. The two men had planned to meet in October 2008, but that session in the final days of the presidential campaign was unexpectedly postponed. Obama called Graham on his 91st birthday last November and the two men again made plans to get together. The two men finally met early Sunday afternoon while Obama was on a brief weekend vacation in nearby Asheville, NC. Graham's meetings with every President since Harry Truman were no accident: both the preacher and the presidents had their reasons  sometimes spiritual, sometimes political, usually both  for getting together. Truman was something of an exception. He was the first president to pray with Graham in the Oval office; but a front page picture the next day of Graham kneeling on the White House lawn infuriated him, and it would be many years before they crossed paths again. The presidents who followed had a different attitude  and so did Graham, who became much more discreet about his Oval Office sessions. Eisenhower mused about recruiting Graham as a speechwriter, to help in the fight against "Godless communism." Photos of Ike and Graham reading the Bible together were featured in Graham's crusade literature. John F. Kennedy sought out Graham for a round of golf in palm beach immediately after the 1960 election  a close-fought campaign in which religion had played a central role. A picture of Kennedy with Graham, a Catholic priest noted that year, was "pure 14-carat gold, to be laid away at five percent interest until the day of reckoning." Lyndon Johnson summoned Graham to the White House soon after JFK's assassination; what had been planned as a 15-minute visit stretched into hours, and included a skinny dip in the White House pool  though that encounter was not photographed. Graham would return many times to minister to Johnson, to the point of spending his last weekend in the White house with him in 1969, before staying on to spend the first night with the Nixons. Graham went on to conduct regular worship services in the White House. Gerald Ford played golf with him; Graham visited Jimmy Carter and his wife in the White House; and his relationship with Ronald Reagan spanned more than 50 years, from 1952 until Reagan's death in 2004. George Herbert Walker Bush vacationed with the Grahams more than a half dozen times during the 1980s and 1990s  and asked him to lead Bible talks for his kids. Bill Clinton first heard Graham preach as a 13 year old in Little Rock's War Memorial stadium; when his marriage to Hillary Clinton hit the rocks 39 years later in the aftermath of the Monica Lewinsky scandal, it was to Graham that the couple turned for help. And George W. Bush credits Graham for playing a key role in his spiritual rebirth at the age of 40. Unlike his 11 predecessors, however, Obama is the first President to visit the evangelist in his mountaintop home. The meeting comes several days after the U.S. Army canceled a planned appearance Franklin at a Pentagon prayer meeting. Franklin Graham had likened Islam to evil in 2001. Gibbs and Duffy, TIME editors, are the authors of The Preacher and the Presidents: Billy Graham in the White House.